Jane Ashford discovered Georgette Heyer’s novels while in junior high school, and became entranced with the glittering world of Regency England. Jane’s historical romances have been published in England, Sweden, Italy, Denmark, France, Russia, Latvia, Spain, and the United State. 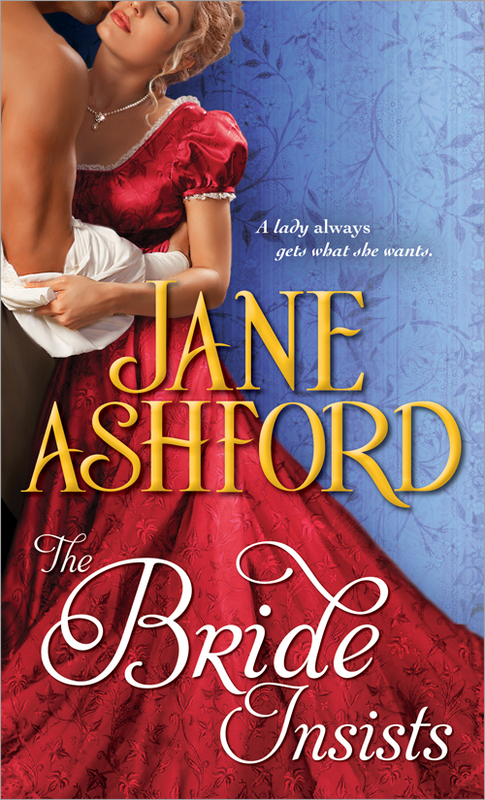 She joins us today to celebrate the upcoming release of The Bride Insists, the second in her Regency Bride series. Grace: What’s the biggest lesson you’ve learned in your years as a published author that applies to the rest of life? Jane: When you find what you love to do, you mustn’t let anything stop you. If you write, you’re going to get rejections. There will be people who don’t like your work (and say so! ), as well as those who do. If you really want to be a writer, you have to pick yourself up after a setback and keep trying. I think that goes for life as well. Grace: What made you start writing? Jane: I’ve loved storytelling for as long as I can remember. As a child I made up stories about the passing scene on long car rides. Writing is what makes me happy. Grace: If readers could only learn three things about you, what would you want them to know? Jane: If you see me at a conference, I’m hoping you’ll come on over and say hello! I like research and care about the “historical” in historical romance. I really appreciate people who take the time to give their reactions to a book. Grace: What do you like to read? Do you have keeper authors, and if so, who are they? 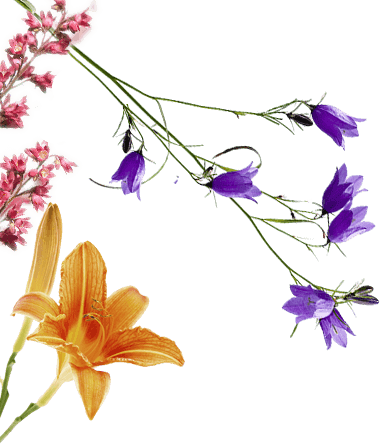 Jane: I read all kinds of genres – science fiction, mystery, mainstream and romance. When I re-read, though, I turn to writers whose characters I love and want to spend time with – Georgette Heyer, Lois McMaster Bujold, Charles De Lint, Jim Butcher. And I never get tired of Folly by Laurie King. 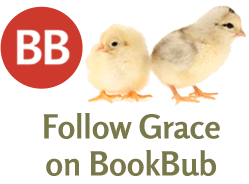 Grace: What’s the hardest part about writing for publication? The most fun? Any wish I’d known then what I know now’s? Jane: You know what? I think the hardest part is titles. Sometimes it’s so difficult, finding the perfect title for a book. The most fun – hearing that readers have enjoyed a story I created. And I wish I’d known that you can just let first drafts be bad. I think it was Nora Roberts who said: You can fix anything but a blank page. Grace: If you had to choose one of your titles for readers to start getting to know you, which one would it be and why? Jane: You want me to choose one of my children? 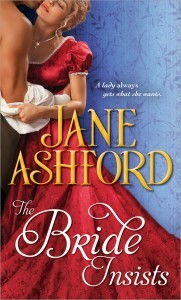 : ) Well, I try to learn and grow as a writer all the time, so I’ll say Once Again a Bride, my most recent book. Sneaking in another choice, I have a soft spot for the hero of The Marriage Wager. Grace: What question would you like readers to answer to qualify for the giveaway or The Man of Honour, The Three Graces, The Marriage Wager AND a $50 Amazon gift card? Jane: What do you love about historical romance? 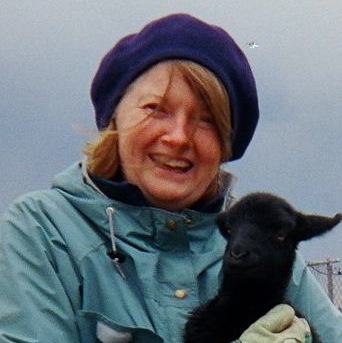 Find Jane Ashford on the web at www.janeashford.com and on Facebook. I love the elegance. The people, the language, the clothes, the behaviour & manner. But mostly I love how the simplest things are romantic, from the caress of a cheek to the touch of fingers. What I love about historical romance novels are the strict adherence to a social and moral code. Rules existed on how ladies and gentlemen should act — and I love how romance authors write about and around these rules to get their character their HEA. I also love the atmosphere of the time and the history. What I love about historical romances is that men were gentlemen and women were ladies. Society was, i think, more polite and more conscious of manners. I love the clothes worn by both men and women. I love the formal way of talking and letter writing. That is one thing I miss today; I love writing letters. There is nothing more fun than to get a handwritten letter in the mail. I like getting real letters to, but when was the last time I WROTE one? For my 90-year-old parents, the internet is a mystery, and letters in the mail are how their grandkids keep up with them. I love the different time period – it’s so much easier to suspend disbelief for me with a setting that is not one I live in. It makes it much easier for me to believe the happily-ever-after endings. Historical romance is my first love when it comes to reading. It was actually introduced to me when I was a teenager by my grandmother who was an avid reader. I loved the idea of living in another time and by different rules of society. The dresses, balls, coaches, titled lords and ladies and of coarse; the romance. Interesting point, Sheryl. I started reading romance in early adolescence, a time when happily ever afters seem few and far between. Then too, I didn’t feel particularly in control of my fate at that age, and a romance novel guaranteed a benevolent fate for the protags…. maybe this is why YA has taken off lately? When I found Georgette Heyer books in the library as a teenager I was immediately entranced! There’s something about a guy in Regency attire muttering his brand of sarcasm or self-castigation that just works, doesn’t it? Westhaven certainly thinks so, and Douglas agrees… when he’s not gazing besottedly at Guinevere. I love the rules in historical romance novels. There were so many rules in society during this time. What type of clothes were worn to a morning tea, to the opera or to a ball? How were certain people addressed? Proper courtship rules. I enjoy a novel when the rules and bent, not necessarily broken. I like it when the hero or heroine know what they want and bend the rules to obtain it. It’s even better if they fall in love along the way. Bear in mind Sue, that a lot of what we attribute to Regency society was what their Victorian grandchildren and children wanted us to think was true. The Victorian upper middle class lady might change her clothes seven times a day, but her Regency great aunt could still have entertained callers as she was getting dressed. I’ve wondered how much of the social code we’ve missed, though. The Victorians left us ton of clues, because people were changing classes very quickly, and needed written guidebooks for every aspect of etiquette. In the Regency, the velocity of social change was slower, and the rules weren’t documented the way they were (obsessively!) fifty years later. There’s just something about Historical Romances that takes me back to a time that seems to be so romantic. Love reading about the gowns, the mansions, the carriage rides and just the overall opulence of the time-period. Of course, if I had lived in the past, I would have wanted to be of the nobility so that I could experience all the pomp and circumstance!! I always wonder about feminine hygiene, about which we know very little, and TP. If you were the average Jane who needed to get on with life seven days a week, how did you cope? In historical romances it seems to me that the man is a man and the woman is a woman. There are some obvious social class issues as well as gender role issues, yes…but in regards to novels where there is *hopefully* always a happily ever after; it’s nice to see such an obvious divide between the two. Clear gender roles appeal to me too, because it’s that much easier to creatively bend them. Some readers can’t stand historical for exactly the same reason. Women and children WERE chattel, and a good man was honor bound to beat a wayward wife, etc. I enjoy reading about a time period that appears so genteel, well-mannered and polished on the surface but the heroines and heroes often have such a hard way to go for the HEA. The dictates of society, proper etiquette and decorum and even the laws against divorce and so forth are fascinating to me. I don’t think I would’ve done well in such a time but it makes for fascinating reading. There are so many wonderful things about historical romance but the biggest thing to me is the escape from present day. I love being transported to a different time where life moved slower and there weren’t things like telephones, cars, computers and video games. And although I know these aren’t history texts it is also so nice to learn a thing or two about history while I read. Of course the HEA is always nice, too. How can you have a fairy tale without the Once Upon A Time? I love the feel of elegance, the way people used their manners, the speech, the rambling residences, trying to picture myself in the same situation today and how different it would be. I love how some authors (grace) show the difference in how people viewed their children, some let to be children and knew they were loved by their parents, and others simply raised to be “the duke”, etc. The Regency was an interesting time, in terms of the transition children were making from being seen and not heard in upper class Georgian households to being the center of the Victorian household (not always in a good way). Not sure I could have borne to send my sons to public school, but as has been pointed out, the Regency public school generation became the governmental, financial and intellectual engine of the Victorian empire. No small accomplishment. While reading a romance I often learn about times long past – how people lived, political and military happening of the time. Also the mental images I have from the description of the clothes and the balls and the house parties are just so gorgeous and glittery – I wish they would make more movies of these stories! Movies would be great. I saw Austenland recently. Would you go to a Regency theme park? I love that I get to live in a past time period, for the length of the book I am reading. That’s why I don’t have a favorite time period, because I want to visit them all. Thank you so much for all the fabulous stories you write – they really are the perfect escape from everyday life. I adore reading about Historical Romance. I love being swept back to another time and place when people lived, laughed and loved, and were finding their way to each other. I love reading about the balls, the fashions, the carriage rides through Hyde Park, and the house parties. I also appreciate all the research Authors do to make their books more authentic. Thank you for the chance to win. I think part of it is that it is just so different from my current reality. And what a better way to learn history and different times than in a romance novel. The authors do all the research and can really put me into another life (lives). Historicals have been and always will be my favorite genre – the passion, the glamour, the intensity of the times. I especially love the strong characters. I could go on and on lol. I love the historical aspect and immersing myself in the rich world of the characters. The first thing that grabs me about historical romance is the covers. The pretty ladies, handsome men (hopefully with open shirts 😉 ) and the gorgeous clothing. The second thing is that it takes you away from a current daily grind & into a different, romantic world. I also love the dialogue, which tends to be wordier & maybe more flowery than in contemporary romance. I love everything about historical romance. In school I always loved history so historical romance lets me experience history. A well researched historical lets me learn new things while being entertained. I can honestly say I’ve been able to answer more than one question on Jeopardy while playing along at home thanks to something I’ve learned while reading one. I also love the fact that it let me forget all the craziness of the modern world. I’ve read everything including soup cans, but historical romance has been my mainstay all my life. It stays current. Now isn’t that the funniest comment you’ve ever heard. But it does, the scenes, costumes, set design, the witty conversation, truly does carry over the years. I like contemporary romance and have read many great authors, but the books do age. Doesn’t make them a bad read, but shows up with every page. A well written historical book DOES NOT AGE, it just gets better. I suppose that is why I am still settled into the past. Now if the book isn’t well written, it doesn’t matter what it is a mystery, sci fi, contemporary, biography, nothing will save it. But the tapestry of a good historical romance just makes me want to sink into the pages and never come up for air. Heck, Grace Burrowes knows I’m an opinioned ole lady by a lake, so she’ll expect my post, but don’t blame her for my opinions, please. I love the history and the romance! Especially the times past with the manners of the day, the clothes, the slower pace with the lovely carriages and horses and that happily ever after is the best part. I was introduced to the Historical Romance genre by my aunt, who was governess to a Greek Billionaire in New York City, back in the late 1960’s. Author of choice at that time? Georgette Heyer. I re-read “Sprig Muslin” just this past month and it is still laugh-out-loud funny. What I love about Historical Romance is the slice of society of that time. The carriages, the dress, the rules affecting gender, what the expectations were for the time…and yet, the characters are so very human, with all the same dramas of life, death, poverty, orphans, widows, etc… It gives me faith in our ability as humans to overcome the current swirls and eddies of life. To love, to be affectionate, to endure. These are the things I truly love about Historical Fiction, and particularly about your books Grace. Thanks for introducing me to yet another interesting author. I look forward to reading her books. I love historical novels much for the same reason I majored in history in college: I’m interested in the day-to-day aspects of life. I realize romance novels are an idealized version of life (and generally the lives of the upper class) but I still love a learning little things about the way people lived and the language when I read a well-researched novel. I love the language of historic romances; the curses, the verbal slings and arrows, the way a character can be described by how they speak and what they say. It’s delightful to read a well versed book. I have always loved history, especially the period between 1800 and 1920. I started reading romance novels years ago when I was going through a depressed period and didn’t want to waste my time on anything that didn’t have a happy ending. Now that I’m retired, I’m reading more than I ever have and HR is my favorite genre. I read a lot of of these novels and a lot of them are totally forgetable. The authors who stand out to me are those who create characters who seem real and are believable. They also have to tell a good story and tell it well. For some reason, romance just seems more believable in historical times than it does in a modern setting…not sure why. The manners and the fact that everyone usually ends up doing the right thing. I like the witty, funny and so elegant romances. I like the slow getting to know you. If its a true historical romance, then I can count on the Happily Ever After. I know that its all going to work out. Even if it doesn’t work out like I expect. It will still be happy at the end. I love that. And I always love surprise stories. Stories that don’t go like I expect. I read a story a while back that was incredibly well done. There were 5 main characters and you truly could not be sure who was going to end up with who and who was going to be the main character in the next story. haha It wasn’t like there was ”sharing” or anything. But they were all uncertain. Loved it! 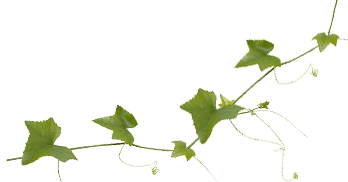 What do I love about historical romance? But then I realize these poor women are peeing in chamber pots and don’t have Hershey bars and are literally using rags (forgive my indelicacy)– and I guess the 2014 trade-off is okay. Hope you’re staying warm– it’s 4 degrees in Pennsylvania today! I love being able to ‘live’ in a era where life was totally different than it is today and follow characters through their trials to find their HEA — without having to deal with the inconvenience of no running water, no electricity, no modern medicine, etc. I have collected all your books so far. As I am older than you, I hope to continue reading your books for the rest of my life. I have lead a book group for the last fifteen years. We read all types of fiction except the classics.